The clock struck 5 am, and within an hour West Ottawa’s robotics team, WOBOT, was ready to pack up and head to Detroit for the Robotics World Championship. 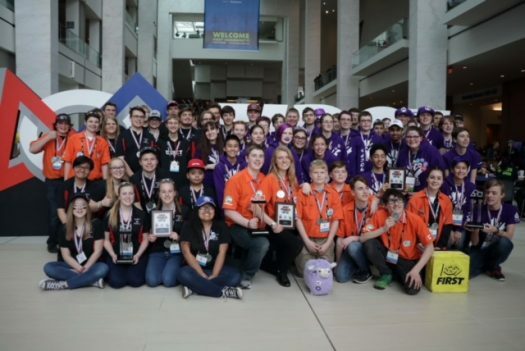 WOBOT joined nearly 400 other teams spanning 6 divisions as they anxiously prepared for the intense competition.“I [was nervous] because we were doing well in the past few competitions, and this is the world champs, so you’re going against teams that you know are very strong,” Sr. Cayla Khoung said. Khoung wasn’t the only one — a lot was on the line, and this single event would be the difference between being good or being great. The difference between standing out among 400 other teams or fading into the background. Now was their chance to prove themselves among the best competitors in the world. “It’s nerve-wracking out there,” Jr. Andrew Smyk said. “I still had fear because not everything can go as planned regardless of if it’s smooth in the beginning,” Khoung said. Nevertheless, Smyk, Khoung, and the rest of the team proudly got to work, ready to compete. Regardless of pre-competition jitters, WOBOT’s participation in the competition was well deserved. “Generally, seasons don’t start until January for most robotics teams, but we started all the way in September, so we can learn what programs to do,” Khoung said. “We get new freshmen. . .so we do teaching courses in the fall until our season hits.” This early on momentum is a considerable part of how WOBOT made it to the world championship. 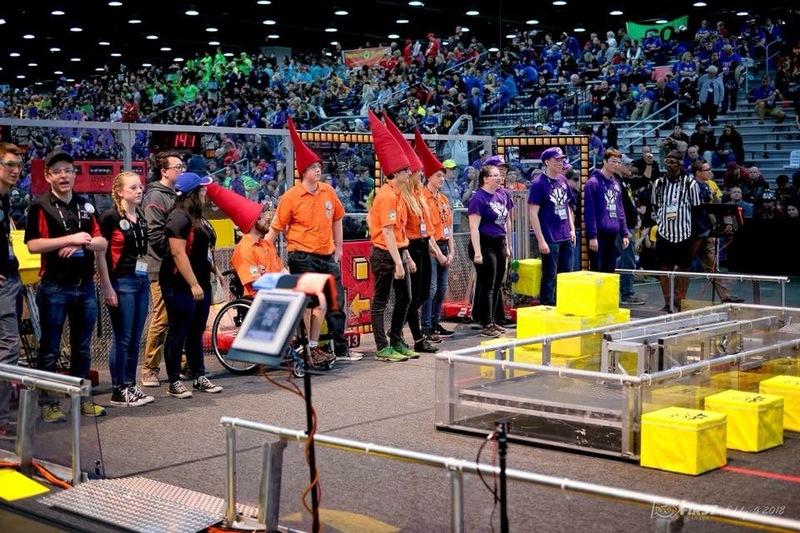 By getting the ball rolling early, WOBOT was able to rack up many wins and prestigious accolades like the Innovation in Controls Award and Entrepreneurship Award, allowing them to make it to the world championship. As the world championship got underway, WOBOT members adjusted to intense 19 hour work days. After waking up at 5 am, all the way until 8 pm, students competed with teams from around the world. And, after that, students spent hours creating their “listings” for the next day in order to pair with the best alliance. “Some of us would be running on five or six hours of sleep, but you’ve got to just push through, which a lot of us did,” Khoung added. Things really started to get serious when students found themselves competing in the first finals match. WOBOT was up against the toughest alliance in not just their own division, but in the entire event, the reigning world champion. “These matches were interesting because at the end we had to climb,” Khoung explained. “You have ten seconds to climb up another robot, so we’re ready, waiting for our teammate, and I’m like ‘Oh goodness. Are they gonna make it?’” As tough as it seemed, the team stayed focused and executed their strategy perfectly. In what felt like only a second, WOBOT’s teammate latched onto their robot, allowing West Ottawa’s robot to be boosted enough to make the final climb, earning them the points they needed to win. By pushing through fierce competition, students not only competed but walked out Finalist winners, bringing home WOBOT’s single best competition. “No one was really expecting it because these guys are really hard to beat, but after we beat them in the first round [the crowd] just went crazy,” said Soph. Nick Radakovitz. In the end, WOBOT won the prestigious title of World Champion Subdivision Finalist. Their weekend at the 2018 Robotics World Championship might be over, but their hard work and prestigious title create a long legacy for WOBOT teams to come. WOBOT’s drive team as they get ready to give handshakes to the opposing alliance before finals, including drive team members Nick Radakovitz, Otto Dryfhout, and Cayla Khoung.